My mom came home tonight from her trip to China and Taiwan. What a ridiculously long flight. After work, I decided to cook dinner for her. I didn’t have too much time, so I just made some sauteed eggplant and green beans. Saute up 1/4 cup of chopped white onions and 1/2 cup of ground pork until cooked. Add sliced eggplant to pot, then add 1 cup of water. Reduce heat and simmer on low. 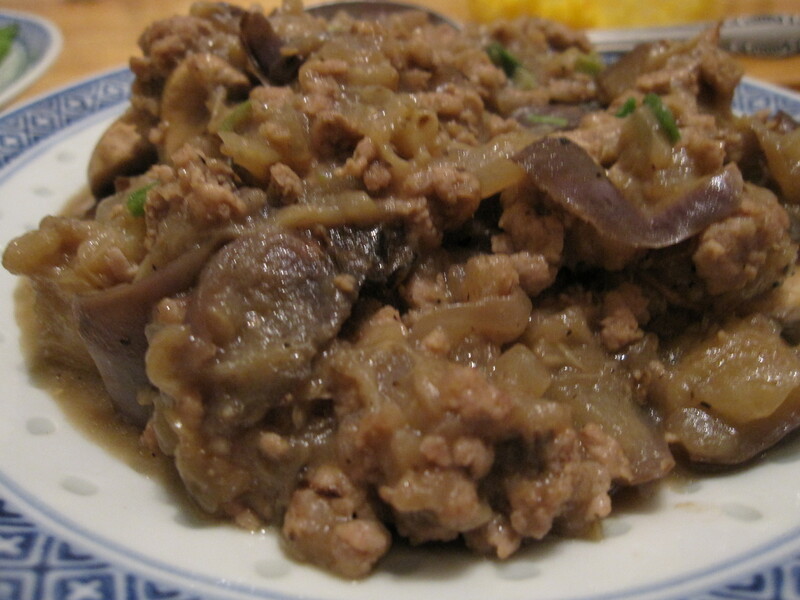 After the eggplant is fully cooked, add in a handful of chopped mushrooms. Mix 2 teaspoons of corn starch, 2 tablespoons of soy sauce, 1 teaspoon of sesame oil, and 2 tablespoons of water together in a separate small bowl. Pour sauce mixture into pan and stir. Season with S&P and garlic chili sauce. Garnish with chopped green onions.